Prime Time Sports Talk | Is Heinen Breaking out of his Sophomore Slump? Is Heinen Breaking out of his Sophomore Slump? Danton Heinen seems to be moving uphill from his slow start, literally ascending in the Boston Bruins’ lineup the last few games to the first line. 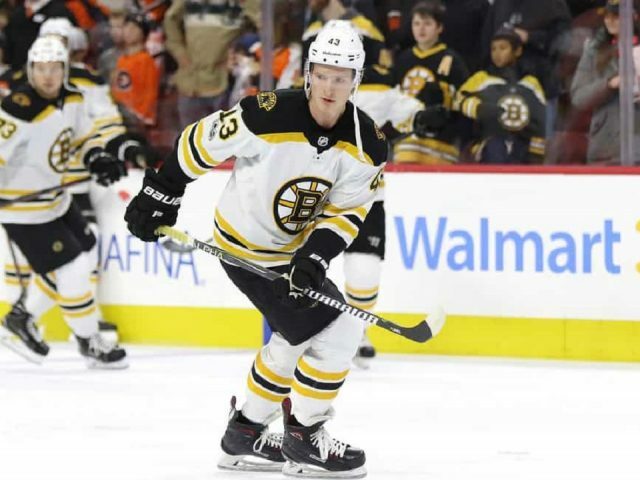 Heinen, 23, is in his third season playing with the Bruins, but only appeared in eight games in the 2016-2017 season, making this his second season as a regular in the lineup. Heinen had a breakout year last season, scoring 16 goals and 31 assists in 77 games, severely raising expectations for the rest of his career by one strong rookie season. Often he was compared to fellow young forward Jake DeBrusk in terms of production and the offensive future of the team, even though DeBrusk was drafted 14th overall compared to Heinen being taken in the fourth round the previous year. This first half of this season, Heinen fell dramatically flat of those expectations with his scoring sheet looking like binary code: ones and zeros, with mostly zeros. In the first 40 games of this season, Heinen scored a meager 10 points, mostly in the form of assists. But in his last 10 contests, he’s tallied six points since Jan. 8. Heinen didn’t have a flawless ten games, though. He also missed two games in that stretch—which adds to the importance of those points—after head coach Bruce Cassidy sat Heinen following his muff of a possible overtime winner against the Philadelphia Flyers on Jan. 31. Since then, Heinen’s appearance in the last two games has produced great—and probably correlated—results: He has three points and has been playing on the first line with the lucrative goal scorers Brad Marchand and Patrice Bergeron. For Cassidy, it isn’t necessarily a reward for missing the opportunity to end the overtime game against Philadelphia the end of last month—rather, it’s Cassidy ensuring that his younger players don’t let their scoring slump bleed disappointment into the rest of their play. “[If] it’s not happening for him offensively, [it] gets you to work hard on the things you can control, and then hopefully you get some rewards down the road,” Cassidy said. Heinen has now played his third game of this trend, starting Sunday’s matinee against the Colorado Avalanche as the left winger for the top line. Though he didn’t get on the board this time, he finished the game with a plus-1, 4 shots on goal, and 39 seconds on the power play.